A modern X-ray procedure is used in computed tomography of the heart (heart CT), offering a gentle alternative to diagnostic cardiac catheterisation. In contrast to cardiac catheterisation, a heart CT can be performed on outpatients and is non-invasive. In this instance, ‘non-invasive’ means that no catheter needs to be inserted into the coronary vessels via an artery. 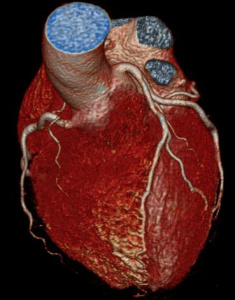 Example of a 3D reconstruction of a heart CT scan for non-invasive rendering of the coronary arteries. In this example no narrowing of the coronary arteries is visible. With the help of a heart CT scan, medically significant stenosis (narrowing of the coronary arteries) can be excluded with a certainty of almost 100%. In simple terms, this means that if no significant stenosis is found during a heart CT scan, it can be categorically excluded. In this case, an invasive cardiac catheterisation procedure would then no longer be necessary. In addition, a heart CT scan will also measure the degree of sclerosis of the coronary vessels (known as the coronary artery calcium score). The amount of coronary calcium measured is directly associated with the risk of suffering a heart attack within the next 5 years. Therefore the method is excellently suited to determining a patient’s individual risk. On the basis of the identified risk, a drug therapy can then be recommended in order to prevent a heart attack. With regards to individual risk stratification, the coronary artery calcium score surpasses both clinical trials as well as laboratory tests. Visualisation of the coronary vessels using a heart CT scan. Special post-processing software allows the coronary arteries to be shown in their entirety in one image. When is a heart CT scan useful? If a person meets these risk factors, preliminary cardiological diagnostics are recommended. As a complementary measure, the heart CT scan delivers the aforementioned results so that the best possible treatment can be determined, alongside preventative measures. 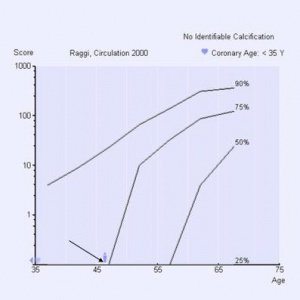 An example of risk stratification based on the coronary calcium measurement. The level measured is provided in relation to the age and gender of the general population. In this example the scan shows no calcification in this 46-year-old patient (see arrow in the image). The ‘Heart Age’ of the patient is equivalent to an age of <35 years. On the basis of this measurement, the relative risk of the patient experiencing a heart attack in the next 5 years is close to 0%. What happens during a heart CT scan? As the heart is constantly in motion, the images captured in a heart CT scan must be recorded in coordination with an electrocardiogram (ECG) at the same time as the scan. To this end, four ECG electrodes will be attached to the chest for the duration of the scan. The scan always takes place in a comfortable reclining position and only takes about ten minutes in total. Before the scan, what’s known as a peripheral venous cannula will be inserted into the crook of the patient’s arm. This small cannula is used to inject an iodine-containing contrast medium to visualise the coronary arteries – following the measurement of the level of calcification in the coronary arteries. If the patient’s heart rate is very fast, a drug to reduce the heart rate will be administered before the scan if necessary. In principle, all patients can examined using a heart CT scan. However, before the contrast medium is administered prior to a heart CT scan, the patient’s creatinine and TSH levels must be determined in the laboratory. The creatinine level is necessary in order to check whether the kidney function is sufficient for the scan. The TSH level is used to rule out hyperthyroidism. Patients with diabetes mellitus who are taking metformin should discuss this with their treating doctor before the scan and discontinue for a few days following a heart CT scan. How high is the radiation dose from a heart CT scan? The radiation dose of a heart CT scan depends on the height and weight of the patient, as well as their heart rate. In comparison to cardiac catheterisation, the radiation dose is generally no higher. If you have a low heart rate, the radiation dose will generally be lower than that incurred during cardiac catheterisation. However, as already outlined, the primary advantage of a heart CT is that there is no risk of vascular puncture (tear in the vessel wall, haematoma). At our branches in Augustenstrasse, as well as our branch in Planegg, we work with the most up-to-date CT technology in order to reduce the radiation dose to a minimum. In addition to the CT scanner itself, this also includes the medical imaging technology (so-called iterative image reconstruction). Our quality standard, however, is to guarantee our patients the best individual diagnostics for their heart. A heart CT scan, in which the patient is promised a low dose of radiation but that only delivers limited diagnostic evidence, makes less sense than a high-quality scan which requires the lowest but nonetheless necessary dose of radiation. Our heart CT diagnostic team includes world-leading experts from the field of heart CT diagnostics, which has seen a significant development in technology in recent years (see list of scientific publications attached). For that reason, our team always selects the most well-suited technology in order to achieve excellent image quality while simultaneously delivering the lowest dose of radiation. Based on experience, all private health insurance providers will cover the cost of a heart CT scan. Patients with statutory health insurance are able to receive an estimate of costs in order to check in advance whether their healthcare insurance provider will cover the costs of the scan or whether the scan needs to be made in the context of self-payment.